Ms. Bartness is rated Martindale Hubbell AV® Preeminent™, the highest rating available, and is listed in the Martindale Hubbell Register of Preeminent Women Lawyers. Ms. Bartness concentrates her practice in the areas of real estate, commercial, banking and environmental law, and commercial mediation. She regularly represents lenders, developers and homebuilders in real estate and environmental matters, commercial and real estate loan transactions, loan restructures, bank regulatory and compliance matters, general corporate matters, and loan work-outs. In addition, Ms. Bartness is a trained mediator, has an active commercial mediation practice and is available for speaking engagements relating to the process of mediation. 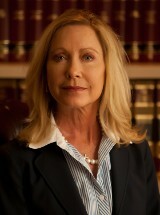 Ms. Bartness was General Counsel for Chase Bank of Arizona prior to joining the firm of Wilenchik & Bartness, P.C. in January of 1992. After law school, Ms. Bartness was a law clerk to the Honorable Valdemar Cordova, Judge of the United States District Court for the District of Arizona, from 1979 through 1981. For the last four months of her clerkship she served as law clerk to the Ninth Circuit Court of Appeals. After her judicial clerkships, Ms. Bartness was hired by what was then Arizona’s largest law firm, Evans, Kitchel and Jenckes for three years before becoming General Counsel of Meracor Development, a subsidiary of Merabank (aka Suncor). Thereafter, Ms. Bartness was appointed General Counsel of Chase Bank of Arizona for 4 years before re-entering private practice at Wilenchik & Bartness, P.C. Ms. Bartness is also a mystery writer. Visit her book website, www.funnymysteries.com, for more information.